The line graph illustrates the world's crude oil prices shown in US dollars per barrel between 1970 and 2005. As can be seen from the graph, prices of crude oil went up and down a lot during 35 years. At the beginning of the period, crude oil was sold very cheaply but before Arab oil embargo in 1976, the price shot up from approximately 2 dollars to just over 10 dollars a barrel by 1974. From this point, there was a small increase to 12 dollars one barrel for the following 4 years before rocketing to well over 30 dollars per barrel when Iranian revolution happened. The crude oil price got higher to nearly 36 dollars when Iran - Iraq war occurred in 1980. However, this did not last long and that number had dropped back to 12 dollars per barrel in 1986. Then, the price fluctuated a great deal for the next 14 years with its highest price during that time period was 20 dollars a barrel in Invasion of Kuwait. 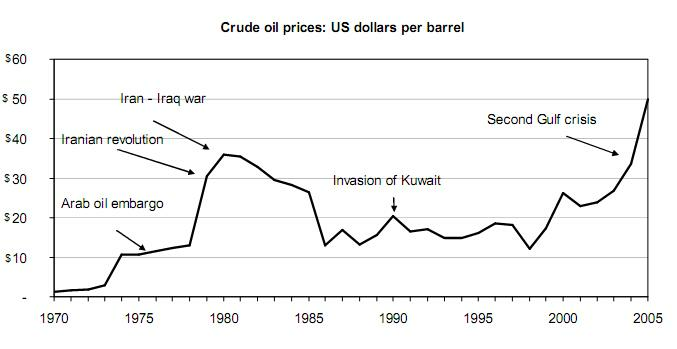 From 1998, the figure rose dramatically to 32 dollars in Second Gulf crisis and reached a peak of 50 dollars one barrel. 1. You should write the overall's information in your essay. > You should use more grammar structures. > What were you trying to say here? > [...] reached the highest peak of 50 dollars one barrel during the event happened. > You should indicate the highest point of the figure in the essay text.